Apoptosis is a process that occurs in multicellular when a cell intentionally “decides” to die. This often occurs for the greater good of the whole organism, such as when the cell’s DNA has become damaged and it may become cancerous. Apoptosis is referred to as “programmed” cell death because it happens due to biochemical instructions in the cell’s DNA; this is opposed to the process of “necrosis,” when a cell dies due to outside trauma or deprivation. The two major types of apoptosis pathways are “intrinsic pathways,” where a cell receives a signal to destroy itself from one of its own genes or proteins due to detection of DNA damage; and “extrinsic pathways,” where a cell receives a signal to start apoptosis from other cells in the organism. The extrinsic pathway may be triggered when the organism recognizes that a cell has outlived its usefulness or is no longer a good investment for the organism to support. Apoptosis plays a role in causing and preventing some important medical processes. In humans, apoptosis plays a major role in preventing cancer by causing cells with damaged DNA to commit “suicide” before they can become cancerous. It also plays a role in the atrophy of muscles, where the body decides that it’s no longer a good idea to spend calories on maintaining muscle cells if the cells are not being regularly used. Because apoptosis can prevent cancer, and because problems with apoptosis can lead to some diseases, apoptosis has been studied intensely by scientists since the 1990s. Apoptosis is an important evolutionary adaptation because it allows organisms to destroy their own cells. At first glance, that may sound like a terrible idea. Why would you destroy part of yourself? Well, perhaps if that part of yourself had become dangerous to the rest, as in the case of cells with damaged DNA that could become cancerous. Apoptosis is a major killer of pre-cancerous cells, and people with mutations that prevent apoptosis from functioning correctly are much more likely to get cancer. Multicellular organisms may also wish to lose cells that are no longer useful to the organism. We’ll share some really spectacular examples of when cell death is a good thing below. A spectacular example of this is found in frog tadpoles, which destroy and re-absorb entire body structures as they undergo their transformation into frogs. Cells from tadpole’s gills, fins, and tail are “told” to die by apoptosis signals as the tadpole matures. The raw materials of these dissembled cells become building materials and food for their new growing limbs. During the early development of the human nervous system, huge numbers of cells die through apoptosis. Why should that be so? The truth is, scientists are not entirely sure why so much programmed cell death occurs in the developing nervous system. Some think it is because forming the correct connections is a complex and potentially difficult process for young neurons; and because maximum efficiency of the nervous system is definitely in the organism’s best interest. Nerves require huge amounts of energy in order to function – in fact, the nervous system consumes about 20-25% of all calories consumed in the human body! Neurons also have to find their way to very precise targets. Early in development, neurons grow from furiously dividing stem cell “parents” and follow chemical signals to try to find the correct target cells to connect with. Connections must be formed between the brain and skin, between the brain and muscles, between neurons in the brain and rod and cone cells in the retina, etc..
To create this incredibly complex targeting, the developing nervous system simply grows way too many cells. Those that connect efficiently with the correct targets are used frequently, and they are preserved. But those that don’t make contact efficiently and are not used frequently die off away by apoptosis. It may be that this theory about why neurons die during development is correct; it may also be that scientists will make important discoveries we haven’t dreamed of yet that will explain why there is so much apoptosis in the developing nervous system. More research is certainly needed! During embryonic development, the feet of mice start out as flat, spade-shaped things. As development proceeds, the feet separate into five distinct toes by the process of – you guessed it – apoptosis! Cells that connect the toes die off in order to create the distinct gaps between them. This is an example of how programmed cell death can be used to shape useful structures and create useful features, in addition to getting rid of un-needed ones. One primary function of apoptosis is to destroy cells that are dangerous to the rest of the organism. A common reason for apoptosis is when a cell recognizes that its DNA has been badly damaged. In these cases, the DNA damage triggers apoptosis pathways, ensuring that the cell cannot become a malignant cancer. However, clearly this process sometimes fails. All instances of cancer are presumably instances where a damaged cell did not commit apoptosis, but instead went on to make more of itself. Apoptosis may be unable to occur if essential genes required for it are among those that are damaged. However, some doctors and scientists have been studying apoptosis intensely in hopes that they may be able to learn to trigger it specifically in cancer cells using new medications or other therapies. As with all drugs designed to kill cancer cells, the challenge with drugs designed to induce apoptosis is to ensure that these drugs only effect cancer cells. A medication that causes healthy cells as well as cancerous ones to commit programmed cell death could be very dangerous. The picture may also not be quite as simple as “cancer occurs when apoptosis fails.” Research has suggested that some cancers may arise in cell populations where apoptosis occurs more easily than it should; possibly these cells have been forced to “learn” to ignore over-enthusiastic apoptosis signals, and subsequently don’t commit apoptosis even when they have sustained severe damage. Other research has revealed that cancer cells which die due to the effects of medication often die by apoptosis – suggesting that cancers that are especially apoptosis-resistant may also be especially treatment-resistant. Much more research is needed on the subject of cancer treatment, and understanding apoptosis pathways is one extremely promising avenue for making new breakthroughs! There are two major types of apoptosis pathways, each of which illustrates an important point about how apoptosis is triggered and why it is useful. In the “extrinsic” pathway to apoptosis, a signal is received from outside the cell instructing it to commit programmed cell death. This may occur if the cell is no longer needed, or if it is diseased. Like most signaling between cells, the extrinsic pathway of apoptosis starts with a signal molecule binding to a receptor on the outside of the cell membrane. Two common types of chemical messengers that trigger the extrinsic pathway to apoptosis are FAS and TRAIL. These molecules may be excreted by neighboring cells if a cell is damaged or no longer needed. As with most receptor proteins, when FASR and TRAILR encounter to their signal molecule – sometimes called a “ligand” – they bind to it. The binding process causes changes to the receptor’s intracellular domain. In response to the changes in the intracellular domain of TRAILR or FASR, a protein inside the cell called FADD also changes. FADD’s name is either amusing or terrifying: it stands for “FAS-Associated Death Domain” protein. Once FADD has been activated by changes to the receptor, it interacts with two additional proteins, which go on to start the process of cell death. Pro-caspase-8 and pro-caspase-10 are inactive proteins until they interact with an activated FADD. But if two of these molecules encounter an activated FADD, the parts of the proteins that keep them inactive are “cleaved” or “cut” away. The pro-caspases then become caspase-8 and caspase-10 – which have been romantically referred to by scientists as “the beginning of the end” due to their role in starting apoptosis. Caspases-8 and -10 disperse through the cytoplasm and trigger changes to several other molecules throughout the cell, including messengers that start the breakdown of DNA after being activated by the caspases. Another inactive molecule called BID is transformed into tBID when the activated caspases cleave off the part of BID that keeps the molecule inactive. After BID is transformed into tBID, tBID moves to the mitochondria. tBID activates the molecules BAX and BAK. 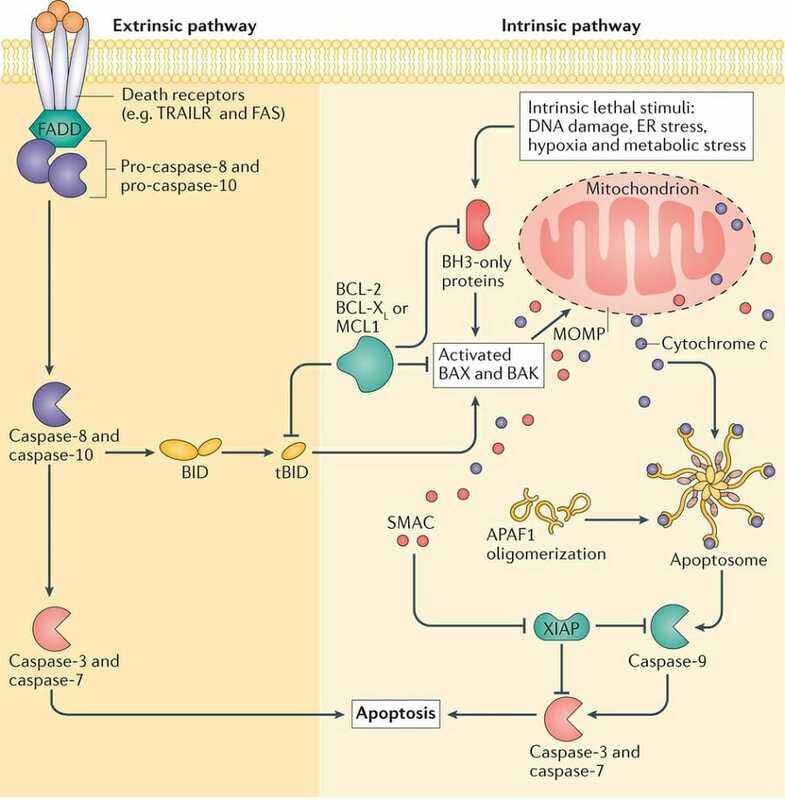 The activation of BAX and BAK are the first steps shared by both the extrinsic and intrinsic pathways to apoptosis. Steps 1-4 listed here are unique to the extrinsic pathway. But after BAX and BAK are activated, the subsequent steps are the same between both pathways. As such, steps 3-7 of the intrinsic pathway, listed below, are also steps 5-9 of the extrinsic pathway! The intrinsic pathway to apoptosis is triggered by stress or damage to the cell. Types of stress and damage that can lead the cell to apoptosis include damage to its DNA, oxygen deprivation, and other stresses that impair a cell’s ability to function. BH3-only proteins are a class of proteins including several pro- and anti-apoptosis proteins. Apoptosis can be encouraged or discouraged, depending on which BH3-only proteins are activated or expressed. Pro-apoptotic BH3-only proteins activate BAX and BAK – the same proteins that are activated by tBID after it is created through the extrinsic pathway to apoptosis. MOMP is considered the “point of no return” for apoptosis. The steps leading up to MOMP can be stopped in their tracks by inhibitor molecules, but once MOMP has been achieved, the cell will complete the death process. MOMP plays its key role in apoptosis by allowing the release of cytochrome C into the cytoplasm. Under normal circumstances, cytochrome C plays a key role in the mitochondrial electron transport chain. During MOMP, however, cytochrome C can escape the mitochondria and act as a signaling molecule in the cell cytoplasm. Cytochrome-C in the cell cytoplasm prompts the formation of the ominous-sounding “apoptosome” – a complex of proteins that performs the final step to beginning cellular breakdown. The apoptosome, once it is formed, turns pro-caspase-9 into caspase-9. Just as with the activation of caspases-8 and -10 in the extrinsic pathway to apoptosis, caspase-9 is able to trigger further changes throughout the cell. Caspase-9 performs several functions to promote apoptosis. Among the most important is the activation of caspases-3 and -7. Once activated, caspases-3 and -7 begin the breakdown of cellular materials. Caspase-3 condenses and breaks down the cell’s DNA. Apoptosis occurs when a cell’s existence is no longer useful to the organism. This can occur for a few reasons. If a cell has become badly stressed or damaged, it may commit apoptosis to prevent itself from becoming dangerous to the organism as a whole. Cells with DNA damage, for example, may become cancerous, so it is better for them to commit apoptosis before that can happen. Other cellular stresses, such as oxygen deprivation, can also cause a cell to “decide” that it is dangerous or costly to the host. Cells that can’t function properly may initiate apoptosis, just like cells that have experienced DNA damage. In a third scenario, cells may commit apoptosis because the organism doesn’t need them anymore due to its natural development. One famous example is that of the tadpole, whose gill, fin, and tail cells commit apoptosis as the tadpole metamorphoses into a frog. These structures are needed when the tadpole lives in water – but become costly and harmful when it moves onto dry land. 1. Which of the following would you NOT expect to trigger apoptosis? D is correct. All of the above are potential triggers for apoptosis. 2. Which of the following might occur if a mutation made apoptosis impossible? D is correct. All are possible consequences for an organism whose cells cannot trigger apoptosis. 3. What is the difference between the extrinsic and intrinsic pathways of apoptosis? A. The extrinsic pathway is triggered by a signal from outside the cell, while the intrinsic pathway is triggered by events inside the cell. B. The extrinsic pathway has more steps because the signal must be relayed from the cell membrane. C. The extrinsic pathway activates BAK and BAX, while the intrinsic pathway does not. D is correct. Both A and B are true. However, C is not true – both the intrinsic and extrinsic pathways to apoptosis must activate BAK and BAX for apoptosis to be completed successfully. Wilson, J. H., & Hunt, T. (2002). Molecular biology of the cell, 4th edition: a problems approach. New York: Garland Science.